This modernized stapler is a bacteria resistant version of the traditional work stapler that features antimicrobial protection and smooth, rounded edges for comfort and natural fit in your hand. An updated design brings superior reliability and a contemporary touch to your desktop. Die-cast all-metal construction - time-tested, with enhanced durability. Smooth new form and finish. Workhorse 747 architecture and features. Staples 2 - 20 sheets of 20 lb. paper with S.F. 4 Premium Staples. These staplers are so reliable & can take on so much work! I've been using Swingline brands for years and the products keep getting better & better. 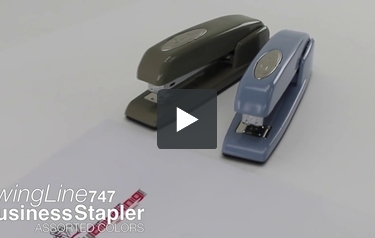 Staples fit neatly, no muss no fuss, staples easily without having to bang on the stapler, overall a great product that only gets better with age! I have two 747 models (one is the classic) that I've used in the classroom for a number of years with great success. However, I recently discovered I was using Standard staples, which allowed the stapler to work after loading the first time, but not after. I ordered S.F. 4 Premium staples from my local office supply company but they have the same issue. The staplers ask for S.F. 4 High Performance staples. Are they still available? I brought this stapler to replace one that did not stand up to my third graders and this one made it thought the year and still works!!! I've been using my 747 stapler for more years than I can count. Very durable. I wouldn't buy any other brand stapler. This is the only brand/model that we use in my office. To address technical issues the best first step is to contact the manufacturers technical support department. The manufacturer is GBC/Acco and their phone number is 1-800-541-0094 .